← Why do it yourself? When I was younger I wanted to visit the Lascaux caves in Southern France to get as close as possible to the famous prehistoric paintings on the walls. Unfortunately, the caves, discovered in 1942 were closed to the public in 1963, shortly before I learned of their existence. Apparently, the hordes of tourists who got there before me weren’t able to hold their breath while walking through the 200-meter structure and their exhaled carbon dioxide damaged the paintings. In 2008, the presence of black mold placed these caves off-limits to all but a few restorers. Now you can only take a virtual tour of the Lascaux caves, but in conditions significantly less dank and less claustrophobic. The movie “Cave of Forgotten Dreams” by filmmaker Werner Herzog also lets you tour a cave art gallery, this time the Chauvet cave, which, too, is in Southern France. The cave was named after one of its discoverers in 1994. 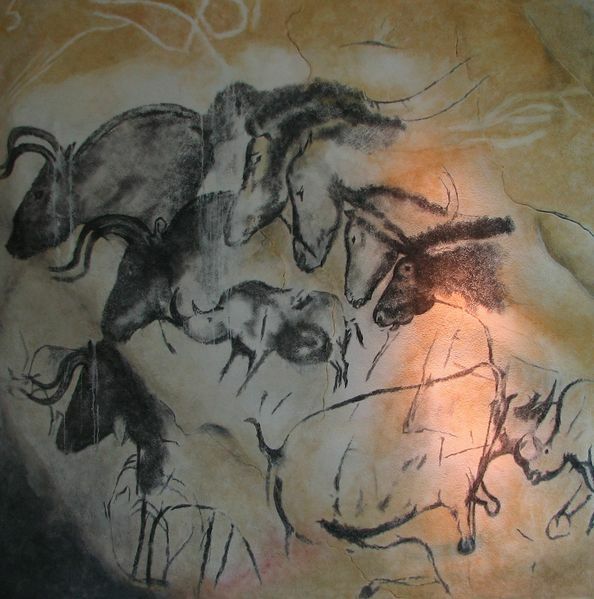 Chauvet is larger than Lascaux with paintings that carbon dating has identified as reaching the advanced age of 32,000 years, nearly twice as old as those in Lascaux. Scientists have taken every precaution to preserve the art and the cave contents, including allowing only a small film crew to enter the structure and then for just short periods of time. Picasso, step aside. These Paleolithic artists were remarkably talented and modern, as you can see from the painting of four horses and other beasts. Equine portraits were intermixed with paintings of rhinos, cave bears, cave lions, bison, ibexes, cattle and reindeer. We also got a close look at the red palm prints made by the mysterious artist with a crooked little finger on his right hand. The movie, presented in 3D, sometimes enhances the viewer’s experience, sometimes adds nothing relevant, and occasionally was completely distracting. The experts who were interviewed seemed only a few feet away from our theater seats and I found it hard not to reach for their images. Sometimes I felt like I was on foot, winding my way through the different caverns, spellbound by what I was seeing, not only on the walls, but on the floors and hanging from the ceiling. Another time, an art historian, who seemed to be standing nearly on my lap, was gesturing with one arm, and her flickering hand directly in front of my face was annoying. After seeing the 2010 Academy Awards best picture nominee, “127 Hours,” about a young man trapped in a cave, and after having had a mild attack of claustrophobia standing in a hillside cave in Arizona watching what seemed like the entire population of the state crawling into this tiny chamber after me, I no longer feel cheated by having to watch cave art on a screen. This film dropped me right in the middle of Chauvet — without having to go through airport screening — and let me experience the art fully. Will your school be anywhere near there? Nice post. I learn one thing more challenging on completely different blogs everyday. It’s going to always be stimulating to learn content from different writers and practice a bit one thing from their store. I�d favor to make use of some with the content on my blog whether you don�t mind. Natually I�ll provide you with a hyperlink in your net blog. Thanks for sharing.